Tracy Rockets made use of his contacts cultivated while at Auburn en route to becoming an assistant coach with the Tennessee Titans. Playing football at Michigan got Joe Holland more than an education. It got him a job. Two, in fact. The linebacker on the Wolverines’ 1988 Big Ten championship team was hired out of college by a fellow Michigan alum, with his football connections landing him the initial interview. That he’d worn the famed winged helmet caught the eye of his second employer, too. “The president of this startup was a huge Michigan fan and lived in Ann Arbor and was a good friend of Bo Schembechler. I’m going to potentially go work for these guys and he’s a Michigan fan? That didn’t hurt me,” says Holland, now the co-owner of an Internet software company. The debate over paying college athletes has clouded this entire football season, beginning with allegations in August that 2012 Heisman Trophy winner Johnny Manziel received money for signing autographs. Johnny Football was eventually cleared, but the NCAA is still fighting an antitrust lawsuit by former players who believe they’re owed billions of dollars in compensation. At the NCAA’s annual convention later this month, restructuring proposals driven, in part, by larger schools wanting more autonomy ― including the ability to give athletes stipends ― will top the agenda. But what, exactly, is a college education worth? Using public and telephone records and social media, The Associated Press traced 90 players who were listed as seniors on the 1988 teams at four schools: Michigan, SEC co-champion Auburn, Akron and Wake Forest. The 23 ― enough for a starting offense and defense ― who could be reached by phone were asked if they got their degrees, what role their educations have played in their lives, and, looking back 25 years later, whether they think the tradeoff was worth it. Each of the 23 had earned his diploma. All said their educations have played pivotal roles in their lives. Though almost all said players should receive increased stipends ― enough to get a pizza with friends or take their girlfriend out to dinner, not buy a new Escalade ― only two questioned whether the scholarship they got for playing football was a fair tradeoff. Only one would make a different choice if given the chance to do it over or would advise his child to take a different path. “You’ve got a unique experience that millions of people would die to have. To put on the uniform, to go into the largest stadium in the country and to get a free education,” says J.J. Grant, one of Michigan’s starting linebackers in 1988 and now a shipping team leader for MillerCoors. For some players, an athletic scholarship was their only means of going to college. Tuition, even at a state school, was too expensive, and that scholarship meant the difference between higher education and a blue-collar job or a career in the military. More than that, however, were the experiences and contacts their education provided ― opportunities that helped shape their adult lives. For some, college was their first time away from home; one player said he wasn’t sure if he’d ever have ventured beyond the state where he grew up otherwise. For others, their status as a college football player gave them entree to a future employer, be it through a direct connection or the affection the large network of alumni and fans have for anyone who wore their favorite team’s jersey. 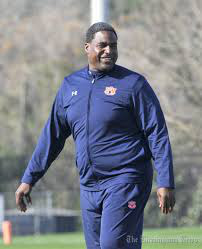 When Tennessee Titans defensive line coach Tracy Rocker got into coaching, he already had a long list of contacts from his days at Auburn, where he was a two-time All-American and the SEC player of the year in 1988. Grant’s former Michigan teammates are now a “Who’s Who” of athletic administrators, business executives and coaches, San Francisco’s Jim Harbaugh among them. While his friends don’t play a pivotal role in his career, they might for his son Derek, a college junior who ultimately wants to get into sports management. A number of players also said the goal-oriented nature of a football team made them attractive candidates for potential employers, some of whom told them they figured that if a man had enough focus and drive to earn a football scholarship, that work ethic would translate to his next job. But Shan Morris, who played safety at Auburn, says he’s done the math on his scholarship, and it doesn’t quite add up. Yes, athletes get a free education, along with room and board. That’s no small thing considering tuition and room and board averaged $17,860 for in-state students at public universities in 2012-13, and $39,518 for students at private schools, according to the College Board. But even with limits on practice that were imposed in 1991, playing a college sport is the equivalent of having a full-time job. And then some. “My scholarship was not worth the amount of hours,” says Morris, now the principal at his own commercial real estate firm in Atlanta. “We were probably working for somewhere between $3 and $5 when you work it out. Even those who think the tradeoff is fair believe players should be getting more than they do. When clothing, transportation and other “miscellaneous” expenses are tallied, the difference between the value of a scholarship and the total cost of an education can be as much as $6,000. Athletes already miss out on part of the college experience because of the time commitments their sports demand. Not having the spending money to take part in the kinds of activities that make college college ― parties, dances, the occasional meal off-campus ― only deepens the divide. “I knew several people that were from poverty-level families, coming to college. It was almost worse for them,” says Shawn Fagan, who was an offensive lineman at Akron. “They got a free education and meals, but they had no money to basically live. Particularly with what the universities are getting in return. College sports generate about $6.1 billion in revenue each year, according to the latest NCAA research. The broadcast deal for the NCAA basketball tournament alone is worth $10.8 billion over 14 years; the combined deals for the new college football playoff system and other top bowls will bring in another $7 billion over 12 years. A little money in their pockets might help some players avoid the temptation of unscrupulous agents and boosters, too. The NCAA’s Division I Board of Directors approved a rules change in October 2011 that would have given athletes a $2,000 stipend for expenses not covered by their scholarships, only to have it tabled after smaller schools objected. That irritated the larger schools of the BCS conferences, who are now the driving force in efforts to restructure the NCAA’s governance. The big schools ― and their conferences ― want the power to make decisions on matters that directly affect them, particularly financial issues.